Our living space speaks volumes! Its subtly mirrors our penchants, eccentricities and is an extension of our persona. Wall décor is the crux of a space design and Wallpaper is the monotony-code breaker. Wallpapers can alter the personality of any space interiors to astonishing degrees. They can make a place come alive, lend it a neutral tone or make them an eyeball grabber for the on-lookers. Our personal and professional spaces are a product of our imagination. While we may have a certain theme or tone in mind, it’s critical that the final product matches our vision. Easy Wall Prints eases the daunting task of zeroing on, how to choose Wallpaper designs? For Personal Spaces- Personal and Informal spaces are getaways to social gatherings and warm family moments. Living Rooms would adorn a wall mural that wows all and sundry. Entry ways or staircases can be made captivating with an interesting panoramic wallpaper that absorbs you as you walk through. Bed Rooms are private spaces that would love a de-stressing and romantic milieu. Kids would be thrilled to find a playful animated image of their favorite characters. Dining Room can have more reasons to flatter you than just food. Choose the point that’s immediately visible when you sit to eat and place a fascinating wallpaper there. Kitchens needn’t be just functional spaces anymore! Pamper them with nice satiating wall décor that is bright and covers spots too. For Professional Spaces- Your places of work needn’t be just routine! Offer them a makeover that’s interesting and refreshing and breaks the boredom code. Offices and Business houses can use wallpapers for corporate branding by displaying company logos and product images. Restaurants, Spa and Salons are an ideal place for rejuvenating wallpapers that add an interesting appeal to their spaces. Schools can have murals that are educational and inspiring. Our living environment nurtures and motivates us. It’s critical to choose a mural that re-energizes and refreshes us. Pick a theme and color that peps you up and keeps you in the best of frames. Its important to choose a milieu that best defines us and keeps us thriving by rendering positive vibe to the home and office décor. Colors are very powerful! Their persona renders an aura and energy to every thing around. It’s crucial to choose a color that’s pepping and enlivening. Colors don’t lend just moods but create space illusions too. Darker hues tend to make spaces look smaller and vice-versa. Kids rooms can have bright shot of colors that fill your little ones with loads of energy and vigor. Meditation rooms should be peaceful with cool colors that are calming and serene. Living rooms reflect individual preferences, some people like a calming green while some may love a dash in red to create an impactful statement. We are all different. We all have our go-to that is individual and unique. If beaches and nature leave you awestruck, our milieus with sunbursts in the forests, deep dark woods, mesmerizing Hawaiian sunsets will suit you to the ‘T’. 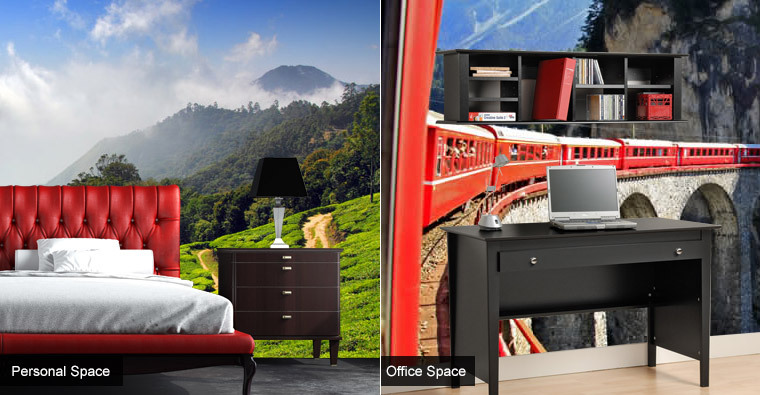 If paintings are what drive you crazy, our paintings wallpapers will keep you happy. If adrenaline-charging sports and music make you rock, our themes will be a great pick there too. We have an enviable gallery of wall décor images with multitude of themes to keep you coming back for more. You have a mood, we have a theme! Size of the wallpaper is extremely important to create the impact on the wall that you have envisioned. A partial wall milieu is equally effective when done with right colors and themes. A full wall covering is the best way to create a dramatic statement as it adds a greater visual appeal to a space with a better value-for-money quotient. Texture and sheen of the mural also determines the final look and feel of your walls. Different textures will have a different impact. Photographs printed onto wallpaper may need a different texture than artistic murals. Easy Wall Prints stays one-up when it comes to delivering the best features in Wall Décor segment. ‘Wallpaper Themes’ are an exhaustive assortment that cover Abstract to Music to 3D to Sports; catering to various moods and settings. 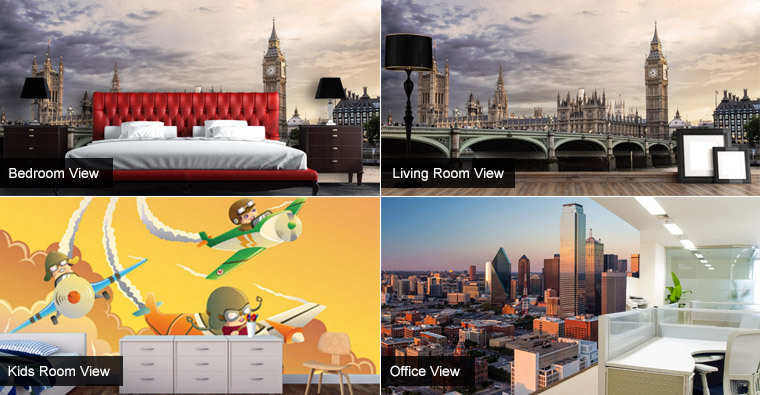 Our ‘Room Type’ option helps you filter the wallpapers that are exclusively meant for specific room types. This is a time and energy saving feature that doesn’t require you to search for wallpaper images endlessly. Our room type categories include both personal and professional spaces. Filters on Colors, City, Places, Flowers & leaves, Monuments that assists you in further narrowing down your search. ‘Room View’ feature is an innovative tool that displays the preview of the chosen wallpaper in different room settings. This helps you envision the look of your chosen wallpaper in different décor and interior settings.